Thexder (テグザー, Teguzā) is a run and gun game from Game Arts, originally released as a PC game for the NEC PC-8001 in 1985 and subsequently ported to a number of other personal computer platforms throughout the 1980s and 1990s as well as the Nintendo Entertainment System. In Thexder, the player controls a fighter robot that is able to transform into a jet. Originally released in 1985 for the NEC PC-8801 platform in Japan, Game Arts licensed Thexder to Square in order to develop a conversion for the Nintendo Entertainment System (NES) game console. In 1987, Game Arts also developed a Thexder conversion for the MSX platform. The game was licensed to Sierra Entertainment for release in the United States. In 1987, Sierra ported the game to multiple platforms, including the IBM PC, Tandy Color Computer 3, Apple II, Apple IIGS, Apple Macintosh, and Tandy 1000 computer and became the company's best-selling title of 1987. In 1988, Activision released the game in Europe on the Commodore Amiga. By 1990, the game had sold over one million copies worldwide. Thexder quickly became a best-selling hit selling over 500,000 copies. The PC8801 platform was only popular in Japan and, despite home market success, Thexder garnered little attention abroad initially. With the conversion for the MSX (the best selling platform in Brazil and many east European countries) it became an international hit. Compute! 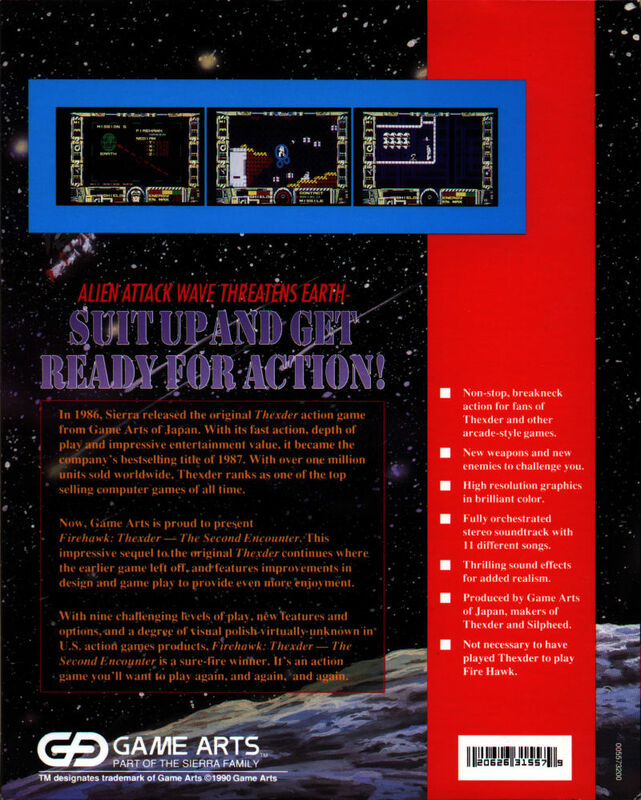 praised the Apple IIGS version of Thexder as the computer's "first true arcade game" with "excellent play value for your dollar". In 1988, The Games Machine gave the Amiga version a 74% score. In 1991, Dragon gave the Macintosh and PC/MS-DOS versions of the game each 4 out of 5 stars. The game went on to sell over one million copies worldwide, becoming Game Arts' biggest selling title of 1987. Thexder is considered an important breakthrough title for the run-and-gun shooter game genre, paving the way for titles such as Contra and Metal Slug. Thexder 2, also known as Fire Hawk and Fire Hawk: Thexder - The Second Contact, was released in 1989 on MSX2 and 1990 on DOS. It retained the same concept as the original Thexder but added many improvements. The Fire Hawk robot had the same design as the Thexder: the main laser, shield, and ability to transform into a jet. It also had upgrades to allow it to launch guided missiles, and use special weapons found throughout the game. Obtaining special weapons caused a weapon carrier droid to be deployed, and if positioned correctly, would act as a shield against enemies. Graphics were improved from the original game, and game play was divided into sub-levels, with the fourth sub-level containing a "boss" enemy. It was also possible to restart later games at the beginning of a level previously visited. Thexder 95 (also called Thexder for Windows 95) is a Windows 95 remake of the original Thexder game, which was built with Microsoft's Game SDK (precursor of DirectX). In this game, Thexder can become a tank and jet, and has a large number of new weapons, from grenades to thermal bombs. The game runs in multiple windows: the main view, and several smaller windows each having a different function, e.g., ammo count, map, and actual game, that the gamer could open, close, and resize at will during play. It was also one of Sierra's showcase games at the launch of Windows 95. Thexder & Fire Hawk is a compilation that includes the MSX versions of Thexder and Thexder 2. The compilation was designed by Hibiki Godai and Satoshi Uesaka, and was released in 2005 for the PC–8801. Thexder Neo is a complete rework of the original PC game from 1985, released by Square Enix. In early 2009, it was reported that Square Enix sent an application to the ESRB to receive a rating for a game titled "Thexder Neo". Later that year, the game's existence was confirmed by Square Enix through an announcement at the 2009 Tokyo Game Show. It was released worldwide on the PlayStation Network on October 1, 2009 as a download for the PlayStation Portable and on January 28, 2010 for the PlayStation 3. ^ a b The Games Machine 7, page 68. ^ Storer, Andy (July 1988). "Thexder". ST/Amiga Format (1): 55. Retrieved 14 January 2012. ^ Trunzo, James V. (March 1988). "Thexder". Compute!. p. 21. Retrieved 10 November 2013. ^ Lesser, Hartley; Lesser, Patricia & Lesser, Kirk (December 1991). "The Role of Computers". Dragon (176): 57–62. ^ Travis Fahs. "The Leif Ericson Awards – Retro Feature at IGN". Retro.ign.com. Retrieved 2011-09-06. ^ "Thexder". Next Generation. No. 16. Imagine Media. April 1996. p. 95. ^ "Square Enix Ltd. announces Thexder NEO available exclusively for download via PlayStation Network". Square Enix. 1 October 2009. Retrieved 16 October 2009. Now you can experience the excitement of the original, complete with revamped graphics, a novice mode, six-player online races, and a host of other all-new features in Thexder NEO. ^ "Square Enix revives "THEXDER", 80's robot action for PS3 and PSP - GIGAZINE". En.gigazine.net. 2009-08-24. Archived from the original on 2012-07-09. Retrieved 2015-11-07. ^ "Sony TGS lineup includes unannounced games, newly announced games". Joystiq.com. 2009-09-11. Retrieved 2015-11-07.